One of Google's new advertising techniques is to plug their so called "search stories," which are now featured on their own YouTube channel. This strategy could represent a kind of electronic literature approach in which the world's largest search engine is used as the platform for unfolding the narrative. The Wall Street Journal's Kara Fisher argues that they might be "Anti-Bing Commercials in Disguise," because Google so rarely expends resources on advertising its own products despite their dizzying range. 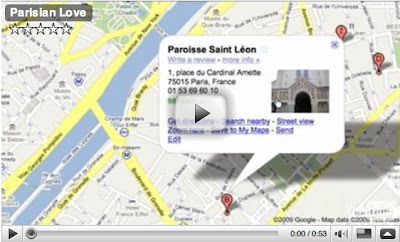 The videos use the automated phrase completion feature of Google's search box to create opportunities for both humor and suspense. As a digital rhetoric person, what I find interesting is the fact that the work of social network sites is shown done by a solo computer user interacting with a search engine and how the montage of supposedly chronologically distinct searches is presented. For example, in "Parisian Love," below, the tool that supposedly brings the couple together is not an online dating site but an animated Google search box. The pathos of "High School" is perhaps the most striking in the group, since it shows the normal social processes that Mimi Ito's team describes in Hanging Out, Messing Around, and Geeking Out as solo ventures. I would say that the logic of the participatory culture argument of "Potholes" seems to be the most mysterious, since it shows community organizing and leadership as merely a process of dogged research. The model of civic engagement in many-to-many modes of online sociality seems to be fundamentally lost.